on blistering red sand, back to the river. in less than a week the clasp has broken. A tortoise flattened by the weight of the world. 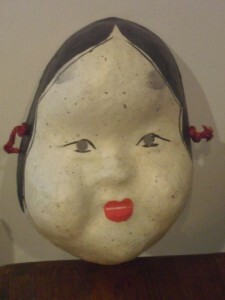 transforms me into a giant geisha. for blossom-viewing days, and a happiness mask. fits perfectly in my cupped palms. As I began to teach film studies in ever greater depth as a freelancer my interest in film locations grew and I currently teach a series of day schools, for Cinema City in Norwich and evenings for the King’s Lynn Community Cinema Club, on films set in London, Tokyo, Paris, Berlin… hopefully the list is endless. So, yes, I have drunk whisky (Suntory, of course!) 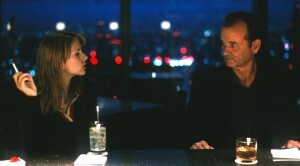 in the New York Bar at the top of the Park Hyatt Hotel in Shinjuku, Tokyo, on more or less the same seats as Bill Pullman and Scarlett Johansson in Lost in Translation. So, what can you expect from this blog? Thanks to a very generous grant from the Arts Council I’ll be spending five weeks in Paris researching and writing a poetry collection which explores Parisian film locations as well as the culture and cafes of Paris, so there’ll be at least a couple of postings from there as well as postings about zombie encounters in Hebden Bridge, dodgy divas in Berlin, City Lights in San Francisco and so on. And prepare to share our (husband Chris will have guest appearances) increasing obsession with the third wave coffee experience that is taking over the coffee-lovers’ world. 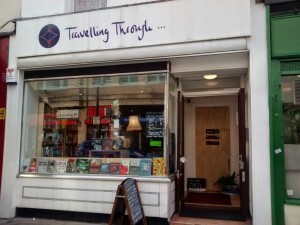 And finally, a place which brings everything in this blog together – the marvellous Travelling Through Bookshop www.travellingthroughbookshop.co.uk in Lower Marsh Lane near Waterloo which has shelf after shelf of books about travel, a great café with fabulous cakes and really good coffee and that’s not all! It regularly hosts workshops organised by the fantastic Hercules Editions www.herculeseditions.wordpress.com. I recently did a day workshop with brilliant poet and tutor Claire Crowther on writing a horror poem which included a screening of “The Cabinet of Dr Caligari”, one of my favourite German Expressionist films. 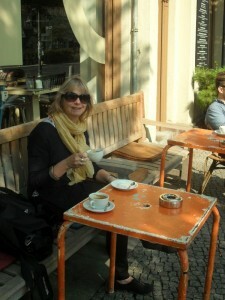 So next month’s post has to be a focus on Berlin! After your course today, it will be so good to find out more about your life and your poetry. So much more to learn now but very interesting class.